Recipe at the end of the post. Fun Fact: Pineapple has some amazing science-backed health benefits! For more details and some fun learning, click here. Sugar and spice and everything nice… like vodka, right? This punchy bev is inspired by a lot of things. It’s inspired by summer and my first real scorcher living in the South (which I’m not sure my Canadian maple syrup blood can handle); it’s inspired by the fact that it’s the weekend (holler! ), but most importantly, this sweet and zippy concoction is inspired by some very special friendships I’ve made in the last six months. Networking is important in business, and in the blogging world it’s no different. But what is also important (and much less evident) is creating solid relationships with fellow bloggers. A few of my closest blogging chums and I decided to give a nod to the significance of blogging buddies – and what better way than through a cocktail link party? If we’re friends, you’ve heard me say it time and time again: bloggin’ ain’t easy. This is especially true when it becomes your life. Blogging for business is a constant battle to balance creation, learning, delivery, analytics, research, promotion, networking – and unlike other jobs, where you have your colleagues to join you in griping about work woes, you’re on your own here. Probably why most of us drink, yeah? When I grumble to my family or friends about the woes that come with running a blog, I know they can’t fathom it and, as a result, they can’t say what I need to hear. They can’t tell me they understand how annoying it is to create fresh, beautiful dishes only to be beaten out in the rankings by uninspired no-bake cheesecakes and anything wrapped in bacon; they can’t moan and groan with me about how fickle Foodgawker can be when they approve one of your mediocre photos only to deny one you consider a total gem the next day; family and friends don’t understand just how taxing it can be to pour yourself into a well-planned post only to have it ruined by a bad photo session. Most importantly, no one but fellow like-minded bloggers understand the struggles of denying unfit paid opportunities in an effort to avoid becoming a sell-out. Decisions are hard, blogging can be trying, and we need our blogging peers for support. We need their constructive criticism and we need them to help push us forward when we feel like we’re falling behind. So, if you’re a blogger, go make blog friends. NOW. Find them in your blogging niche and, heck, outside of your niche too! To say it’s rewarding seems like an understatement. To my blogging friends – thank you. Thank you for being my inspiration, my fuel, and the incredible support that you’ve been and will continue to be. To a cocktail shaker (see notes if you don't have one), add the lime juice, jalapeño slices, and a pinch of ground cumin. If using a shaker, fill it with ice and add the vodka, pineapple juice, and a light drizzle of honey (optional). Shake well, and strain the mixture over ice in a small cocktail glass. Things that make great cocktail shaker substitutes: Sports bottles, jam jars, biscuit tins - or most anything with a lid. Cheers to you, Dana! It was so much fun dreaming up this collab with you, and your punch looks incredible. I love sweet drinks with a bit of heat and this one is right up my alley! Thanks for being my blogging chum -- I'm so grateful we were able to connect through FBC. :) Have a great week! Pineapple and jalapeno make such a great combo! Love the spice with the sweet. Thanks for sharing! Thanks for stopping by, Renee! I'm with you. Spicy and sweet is where it's at. What a sweet fruit and fiery cocktail all the elements needed in a cocktail! I love love love cocktails with a spicy twist! Makes me want more, ha ha ha! I like this punchy punch! 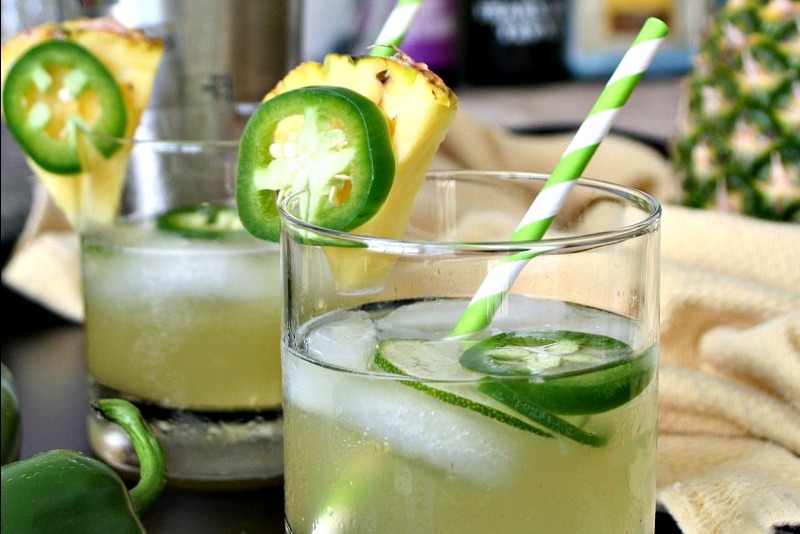 Pineapple and jalapeños make such a fun flavor combo -- people don't use them together enough! There's actually a cider on tap at a bar near me that combines these flavors...very summery! Thanks, Nicole! Oh boy, I'm a total sucker for a good cider. What do you think of beers infused with herbs? The bottle shop near our place has one infused with thyme and it is goddamn glorious. These pics are great and so yummy looking! Cheers Dana :) It's been a lot of fun working on this with you and the others, and I can't wait to do more in the future. I'm also super-grateful to have you as a blogging buddy. I think a lot of people don't appreciate what working from home can be like (i.e. isolating), and how great it can be to have someone who's basically like your awesome coworker buddy. You hit the nail on the head in terms of the struggles. It might seem odd to complain, but it's so nice to have someone understand the frustrations that come with this particular corner of the internet. So here's to creating beautiful, delicious, inspired (and inspiring) food - and nary a block of cream cheese in sight. Cheers buddy! And you've definitely nailed it. Working from home is so very isolating and I totally appreciate the fact that I can treat you as my long distance colleague to whom I can gripe with and hit up when I need a laugh or have a stupid joke. You're the colleague I'd try to keep a straight face with after placing someone's stapler in a jello mold. Haha. Definitely looking forward to working together again and shattering candied bacon ceiling! Love a spicy cocktail and this one looks amazing! Also loved your thoughts about blogging woes. Had a good laugh about the no-bake cheesecake and bacon-wrapped anything. So true, so frustrating, but so important to stay true to yourself and be authentic. Thanks, Elaine! Haha, I'm glad you were able to appreciate the jab at the no-bake cheesecake and bacon takeover. But, exactly as you said, it's important to remain true to yourself and even if it means less craze, at least we're being innovative :) That will catch up to us in a good way eventually.